The Ketogenic Diet for Health: What about the sugars in breast milk? What about the sugars in breast milk? Something that nearly always comes up when we talk about babies naturally being in ketosis is the fact that breast milk contains sugars — as much as 40% . Some people have even argued with us that therefore babies are not in ketosis! @Dr_Rousseau @Jonathan_Witt "Assumption" of babies being ketogenic is wrong. Breast milk is 40% carbs, not ketogenic. That objection is, of course, reasoning backwards — objecting to a fact because it doesn't fit a theory. That healthy, breastfed babies live in a state of ketosis and use the ketogenic metabolism for energy and growth is not a hypothesis; it is an empirical fact. See our article on ketogenic babies for details. However, the fact that babies are in ketosis even while consuming a diet relatively high in carbohydrates does pose a mystery that deserves investigation. In this article, we're going to suggest one possible explanation for the mystery, but remember that this possible explanation is just a hypothesis, until someone does an experiment to test it. 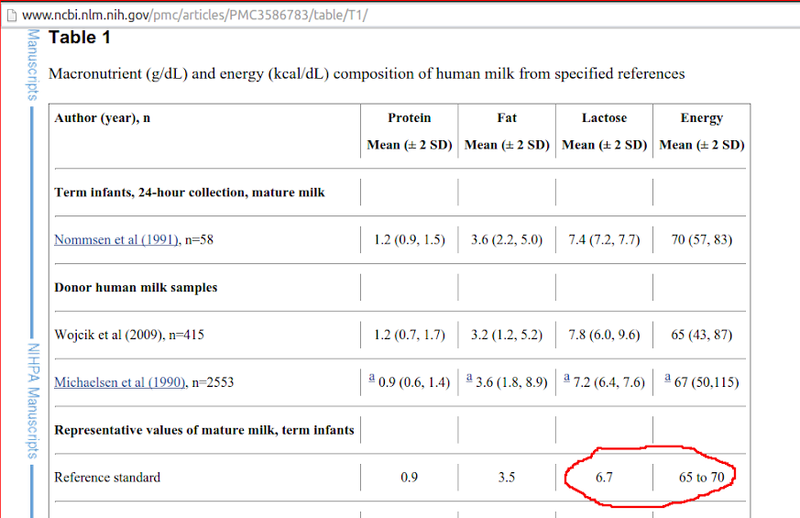 We can't conclude, just because breast milk has a relatively high proportion of carbohydrates, that babies are burning a lot of carbohydrates for fuel. Breast milk is full of components that are good for building brains. Infancy is a period of intense brain growth. The sugars in breast milk are mostly from lactose, with small amounts in the form of oligosaccharides. Both lactose and oligosaccharides are replete with components that are crucial building blocks of brains. In addition to providing materials for growing brains, other non-fuel functions of at least oligosaccharides include serving as prebiotics and fighting infection. Insofar as some parts of the milk are being used for other purposes, they can't also be used as fuel. Therefore, a plausible explanation for how babies are in ketosis while consuming a relatively high-carbohydrate food, is that those carbohydrates are not being used as fuel, but rather as building blocks for the brain, and to a lesser extent, feeding gut bacteria, and fighting infections. Most of the carbohydrate in breast milk is lactose, which is broken down by digestion into glucose and galactose. Galactose is an important component of some glycoproteins and glycolipids, including cerebrosides — glycolipids in the brain and nervous system. Cerebrosides made of galactose are a major component of brain tissue . They are also such a large component of myelin that cerebroside synthesis has been used as a measure of myelination or remyelination . It is therefore plausible that much of the galactose in breast milk is used for brain tissue and myelin synthesis . In fact, glucose is itself also used for making glycolipids for brain tissue , , although ketone bodies seem to be preferred , . After lactose and fat, oligosaccharides are the largest component of breast milk . Oligosaccharides are unique to human breast milk — other animals produce almost no oligosaccharides in their milk . Oligosaccharides are thought not to function as fuel. Some have been shown to have a prebiotic role , . Much of the oligosaccharides pass completely through the infant's digestive tract, and probably have an immune system function , . Oligosaccharides also contain sialic acid , an important component in the brain used for cell-to-cell interactions, neuronal outgrowth, modifying synaptic connectivity, and memory formation . The main point to take from all this is that many of the components of breast milk that one might presume to be used as “calories” are actually being used for other things, especially to make brains with. That includes glucose, galactose, proteins, fats, and even ketone bodies. This could explain the fact that infants are in mild ketosis while breastfed, even though breast milk has higher carbohydrates than would support a ketogenic metabolism in an adult. Infant physiology, nutritional requirements, and lactational adequacy. Am J Clin Nutr. 1985 Feb;41(2 Suppl):447-58. Pediatr Clin North Am. Feb 2013; 60(1): 49–74. Energy metabolism in developing brain cells. Can J Physiol Pharmacol. 1992;70 Suppl:S118-29. Biosynthesis of phospholipids and sphingolipids from acetoacetate and glucose in different regions of developing brain in vivo. Ketone body metabolism in the neonate: development and the effect of diet. Edmond J, Auestad N, Robbins RA, Bergstrom JD. Arch Latinoam Nutr. 2001 Dec;51(4):332-9. Human milk oligosaccharides: only the breast. J Paediatr Child Health. 1997 Aug;33(4):281-6. "Over 100 years ago it was first deduced that a major component of human milk must be an unidentified carbohydrate that was not found in cows milk. At first this was thought to be a form of lactose and was called gynolactose. We now know that this was not a single carbohydrate but a complex mixture of approximately 130 different oligosaccharides. Although small amounts of a few oligosaccharides have been found in the milk of other mammals, this rich diversity of sugars is unique to human milk. The oligosaccharide content of human milk varies with the infant's gestation, the duration of lactation, diurnally and with the genetic makeup of the mother. Milk oligosaccharides have a number of functions that may protect the health of the breast fed infant. As they are not digested in the small intestine, they form the 'soluble' fibre of breast milk and their intact structure is available to act as competitive ligands protecting the breast-fed infant from pathogens. There is a growing list of pathogens for which a specific oligosaccharide ligand has been described in human milk. They are likely to form the model for future therapeutic and prophylactic anti-microbials. They provide substrates for bacteria in the infant colon and thereby contribute to the difference in faecal pH and faecal flora between breast and formula-fed infants. They may also be important as a source of sialic acid, essential for brain development." The first prebiotics in humans: human milk oligosaccharides. Coppa GV, Bruni S, Morelli L, Soldi S, Gabrielli O.
J Clin Gastroenterol. 2004 Jul;38(6 Suppl):S80-3. Prebiotics in human milk: a review. Coppa GV, Zampini L, Galeazzi T, Gabrielli O. Dig Liver Dis. 2006 Dec;38 Suppl 2:S291-4. Survival of human milk oligosaccharides in the intestine of infants. Chaturvedi P, Warren CD, Buescher CR, Pickering LK, Newburg DS. Adv Exp Med Biol. 2001;501:315-23. Sialic acid in human milk: composition and functions. Nakano T1, Sugawara M, Kawakami H.
Acta Paediatr Taiwan. 2001 Jan-Feb;42(1):11-7. Sialic acid is an essential nutrient for brain development and cognition. Annu Rev Nutr. 2009;29:177-222. doi: 10.1146/annurev.nutr.28.061807.155515. I dunno, but wouldn't the fact that baby brains use somewhere between 60% to 70% of energy necessitate the use of ketones. 40% carbs is simply not enough. Seems pretty simple to me, but maybe I'm stupid. Mothers milk is perfect food to get baby going to optimal health fast like for babies survival the first year of life. Sometimes more. The sugar and the fat is what makes it perfect. Babies eat everything. Everything they see and touch goes to their mouth to see if it's good to eat. Natures perfect plan. Nature did not make hybrid carbohydrate plant life though.. In true nature meat and fat make up most of the diet..
Galactose is converted to glucose for fuel. Search on galactosemia. QED. Babies do still go into very mild ketosis from time to time, moreso than adults, but lactose is the most consistent macro in breast milk. Sorry? Galactosemia is a genetic disorder in which galactose can't be broken down, which leads to toxicity from galactose 1-phosphate, and damages organs. Fascinating! Thanks for this interesting exploration of what might be happening with breastfed babies. Love your ideas.